Mega Sale! Free Shipping Included! 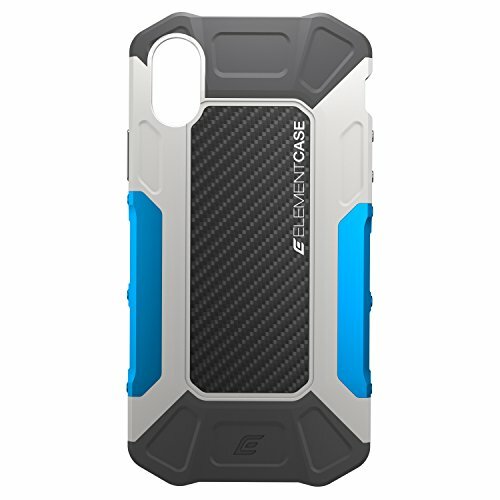 Save 23% on the Element Case Formula Drop Tested Case for iPhone X - Grey/Blue by Element Case at All Company Mobiles. MPN: EMT-322-175EY-02. Hurry! Limited time offer. Offer valid only while supplies last. Exceptionally strong. Incredibly light. For those who live life at full throttle, here’s phone protection that powers through at the speed of you. Exceptionally strong. Incredibly light. For those who live life at full throttle, here’s phone protection that powers through at the speed of you. Element Case has built a chassis forged with aerospace grade carbon fiber and CNC machined aluminum, and combined it with high impact TPU. The result is a case that’s extraordinarily lightweight, yet rugged enough to meet military specification drop-test requirements. Featuring Drop Shock Corners, with its exclusive impact absorbing four-corner design that dissipates energy to withstand extreme bumps and drops; FAST TAP CNC buttons, constructed from molded polycarbonate to provide the same high level of functionality and tactility for iPhone volume and on/off controls while the case in on; and HIT technology, with co-molded high impact TPU that provides extreme protection at both ends of the case. When it comes to a pairing of protection and style, this is the winning formula.